Trying to learn how to get food in France. It’s a bit daunting finding what I want. This is if course based on very limited experience, less than two weeks in the city of Strasbourg. Hopefully I’ll learn more as time goes by. Obviously all the basics, milk, meat, cheese, fruit and veggies, are there. What I am missing are the frozen food alternatives for microwave or oven that are so common in Sweden. They may exist here, but I just don’t recognize them. French supermarkets (at least these two) seem a lot more primitive their their Swedish counterparts. For one thing, in Sweden when you buy fruit or vegetables they weigh them right there at the check-out. Here you have to weigh them yourself on a scale in the produce section. (if you don’t the whole check-out process grinds to a halt, or they send you away.) Really seems like a step into the past. The check-out itself seems wrongly constructed. After the food scrolls past the cashier, there is almost no space for it while you bag up. The whole line comes to a halt while each person bags their stuff. In Sweden there is lots of room beyond the cashier to do this, and two separate sections, so the next person’s food can be moving in separate from that of the previous person. Of course, in the US, there is usually a person bagging your food for you. I’ve always thought Swedish supermarkets more primitive than American, with less choice and less service. France seems to be a move in the opposite direction. Last Saturday we went to the Lidl store in Kehl in nearby Germany. Everyone says food is much cheaper in Germany than in France. On top of all this, opening hours in France (and apparently in Germany as well) seem medieval. This would be more of a surprise if the situation hadn’t been similar in Sweden only a few years ago. I remember how every year the foreign students would be completely taken aback at Easter, when all the stores, grocery and otherwise, were closed from Good Friday through Easter Monday. If you didn’t stock up, you went without. The Swedes all knew, of course, but no one thought to tell the foreign students that Swedish stores close over Easter. But at least even then outside of major holidays, grocery stores were open on Sundays. Not so in France. Everything closes, not just ordinary shops, but also the grocery stores, many restaurants, and even the cafes. The only exception seems to be very small hole in the wall food shops. Apparently they have to pay extra to stay open on Sundays, and can’t use employees, which means only family-run businesses can get away with this. While once it may have been the Church that wanted to keep holy the Lord’s Day, today it seems to be the unions who want to protect their members from working on Sundays. This is incredibly short-sighted of course. Sunday opening means more sales and more jobs. If you have to work on Sunday then of course you don’t have to work some other day of the week, and of course you get paid lots more. While the Swedish unions still don’t seem to completely appreciate this, at least there has been an improvement over the years, and it would be difficult to go back. 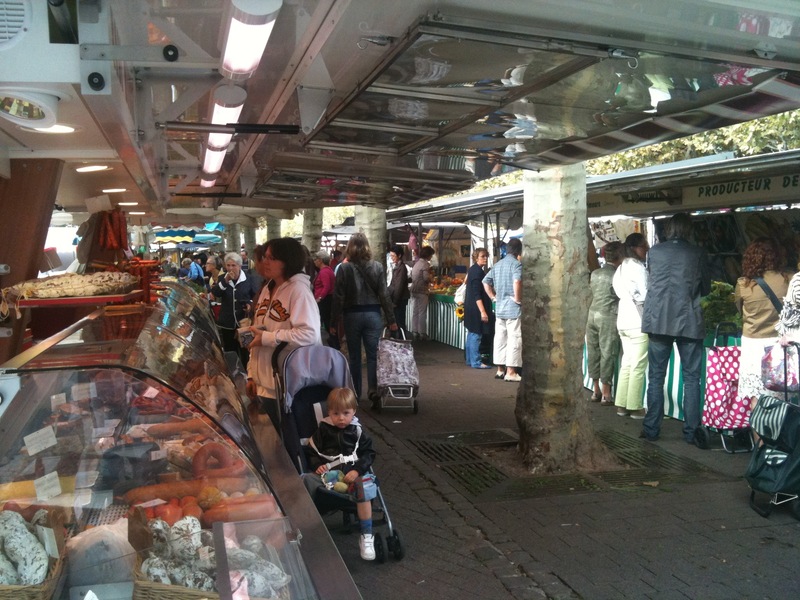 I know too little about France yet to know if anyone here is fighting for the right to buy food on Sundays.